Not the Bahamas. 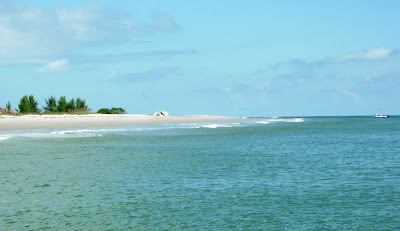 It's the tip of the Cape on September 25, 2011. Mission creep: the tendency of a target or goal to change or evolve as a mission progresses. It's a rare property search that doesn't involve some mission creep. A typical condo search will usually begin a with a list of important criteria. One's mental image of the perfect ocean condo might be a three bedroom, upper floor corner unit with a two car garage in a complex with tennis courts, pool and hot tub that allows weekly rentals and large dogs. If searching in Cocoa Beach and Cape Canaveral that search is over before it begins as that particular unit doesn't exist. The mission to find an acceptable unit is going to have to creep away from the initial target. There are some criteria or combo of criteria that so limit a buyer's choices that a unit is unlikely to ever be found. 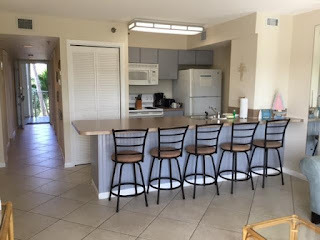 If looking in Cocoa Beach and Cape Canaveral for a three bedroom condo that allows weekly rentals the choices are immediately reduced to five complexes. The same shortage of choices exists with complexes that will allow a dog over 50 pounds. Combine the two criteria and you've eliminated all the possibilities. Similarly, making a two car garage a must have will severely restrict the possibilities. Not impossible but begin to add other unbending criteria and the list starts to rapidly shrink. It makes sense before beginning a search to list all the things that are important and to decide which ones are must-haves. A list of pretty units assembled from the MLS or Realtor.com might not contain a single unit that will work because of missing features or restrictions not mentioned in the listing. Talk to your agent about the reality of finding a unit that matches your criteria before putting together a list of units that look good but may not work for you. You might decide that a two car garage is not as important as being able to bring Scrappy Doo to the condo with you. Prepare for the possibility of mission creep. Deals are out there and flexibility increases your choices.